Scandinavian designers have the reputation of being amongst the best designers in the world, and certainly they maintain their reputation so far as the Imperial Bio cinema, Copenhagen, is concerned: it has been described as the most modern and best designed cinema in Northern Europe. The Imperial is in the heart of Copenhagen and is part of an enormous block of offices, plus one of Copenhagen's lush hotels, also called the Imperial. The cinema itself lies in the centre of the building and has an imposing frontage surrounded by shops. There are large glass doors leading directly to the three cash boxes in a row. One then enters the main vestibule, which also houses several window displays, a large bar as well as a huge sweet shop called "Sweet City". The main vestibule, which has a very high ceiling with a marble floor, can easily accommodate close to a thousand people - very wide staircase leads up to the next vestibule where one finds a lounge and a second bar and more sweet sale. Leading from the second vestibule are galleries which overlook the ground floor vestibule, so that on gala nights, for instance, the audience can easily watch celebrities coming in to the theatre without getting in anybody's way. 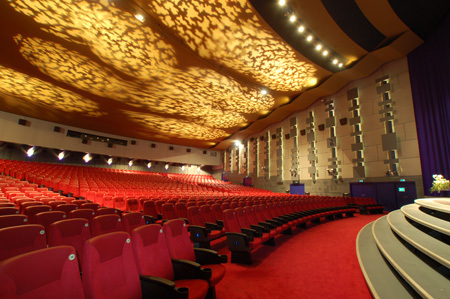 The auditorium is an amphitheatre in shape and seats 1,102 people in large, specially-designed "Imperial" seats with more than ample leg room between the rows. In fact, there is no real need to stand up to allow people to pass by. 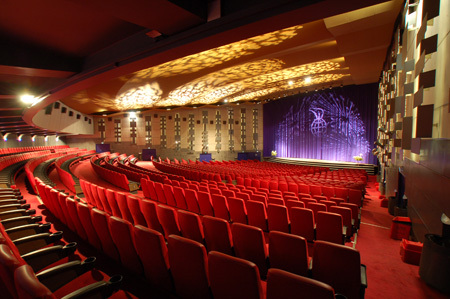 Not least of the assets the theatre has is its "cold ceiling" which provides most efficient air-conditioning. It is also responsible for the heating. It has a pleasant gold tint and is a thousand square metres in size. 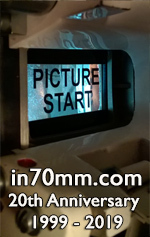 The throw is 34.2 metres, giving the following 70mm screen size: 15,6 metres x 7,4 metres. The sound system throughout is by JBL, and is fitted for seven track digital stereophonic sound. Five channels of speakers and subwoofers are behind the screen and 42 surround speakers along each of the side and rear walls. There is also a telemagnetic cord-less deaf-aid system which enable people wearing their own deaf-aids to pick up the sound by induction from the side walls which contain special cables transmitting the sound. 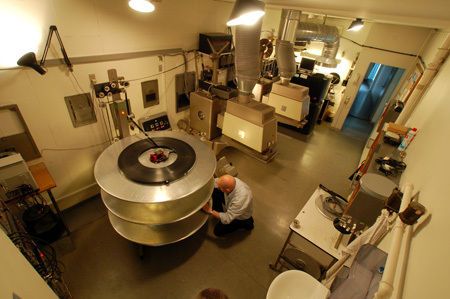 Responsibility for the day-to-day running of the theatre plus the booking of programmes is in the hands of Nordisk Film Cinemas in Denmark.